As of July 8, 2013 I graduated from Midland College 's Truck Driving School. I am now a rookie dry van hauler with Conway Truckload out of Joplin, MO. I am 60 years old, happily married and recently retired from 20+ years of service with State of TX. Please visit me at SunnyWalker.net. Ok the hog kill I survived-still here. I m now officially done with my 25 day riding with a trainer. I get a ck our drive this fri n then m dug loose to start driving. Thanks TtuckingTruth.com!!!!! Its been a journey to begin here n your help made a big difference. Thanks! I did it last night! I was driving up thru a rural area and hit a wild boar! Took off part of the bumper on drivers side. Everyone is teasing me about it. Did I bring it back for bar-b-que? (No it probably weighed over 150 lbs). They are saying my new handle is "Hog Slayer" but I am going to stick with "Traffic Jam." This is LAST week of mentor/training! As they say down Texas way. . . Yeeeeeeeeehaw! Get in the High Road CDL Training Program on this site. You will really benefit from it and enjoy it at the same time. I don't think anything I have seen compares to it. Good luck and come join us at Averitt Express. "The Ultimate Truck Parking guide, third edition". Here is an excerpt: "the Ultimate Truck Parking Guide was written for over-the-road truck dirvers. The primary purpose of this book is to provide a comprehensive list of tractor-trailer parking locations. In fact, this book provides over 8,700 locations." etc. More info at: ParkMyRig.com I bought my copy while at Con-Way Truckload. I think there are similar resources out there. Dear Brett C: I see a lot of Swift drivers coming into the Dollar General service ctr., at Ardmore, OK where our company is part of the account. They all have clean trucks and seem to be doing real well. Early on I learned not to worry about . . . learning! We all have to start somewhere and the most skilled truck driver had to learn backing like I did at one time or another. Have fun! One other thing-While I was waiting to start orientation last week I started over again with the High Road online cdl training offered here on Trucking Truth. 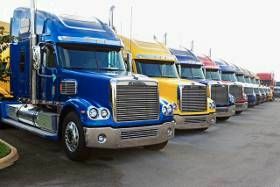 Thanks again to Brett and all involved for this web based training that is made available here on Truckingtruth.com There is nothing like it and I really appreciate it. While I do not speak for Averitt Express it does look like one does have to have a CDL to work at Averitt Express. I say this as I did not notice in any of the literature or web site an ad for a truck driving school for via Averitt. I wa snot lookin for that specifically though and I would advise you to ck out their web site. My experience was I came as a recent graduate of a truck driving school(Midland College, Midland TX). For those types of drivers Averitt has a "student program" and like many companies that use recent grads it involves a few weeks of driving with a "finisher/trainer/mentor" before you are issued equipment. This is reasonable as a student has no real track record when it comes to professional driving and one of course needs further training after school. I finished orientation and came home on Thursday and was assigned a trainer and met with him that day. I was able to get a nap in before I met up with Ken and we hit the road for that day and Friday. Friday evening I went home for my days off-Oh I think I am going to like this! I meet up with Ken again on Sunday afternoon and we will drive to Ardmore where Dollar General has its distribution ctr. We will sleep there and so we ready for a full week on Mon morning. We load up and then go out in TX, OK, and NM to different Dollar General stores to make deliveries. I am in training but normally am paid a cpm wage, a stop wage and a unloading wage. Most of the pieces are in roller carts and so unloading is not to big a chore. That is once one gets "in shape" as I guess I have been as my brother says a "couch potato" too for too many weeks. This will get me is shape for hiking I can say that-at least the upper part of the body and I will probably drop some weight. That will be good too. One word on Averitt Trucks: WOW! Man that automatic transmission is fabulous! I have been shifting perfectly every time I drive. It took about 5 minutes to get used to and from then on its smooth sailing. I did not notice that I lost any of my Macho Man truck driver image at all. In fact, I think it helped it. I start out from a stop, no grinding, shifting at the right rpm and speed, down the road I go it looks good, feels good, is good. The truck has a brake pedal and a accelerator. That's it. No clutch or big gear shift. Some models still have a clutch I have heard. I noticed that the trans still assists in slowing down by shifting down when you slow, it's just the greatest thing. A driver still may shift manually but there is no conventional stick shift. I think this might get more folk into truck driving perhaps. Anyway, I use the cruise control also and it just works great. I am having a blast so far. I forgot to mention the most important portion of the menu in the morning breakfasts: COFFEE!! Sorry for typos. Its hunt n peck on this Kindle Fire. Traffic Jam.